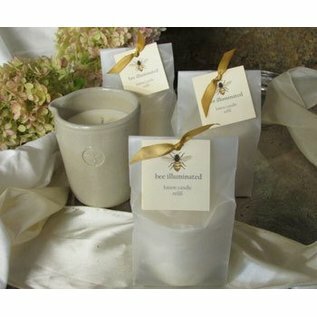 Our lotion candle refills are made with soy wax, shea butter, sweet almond oil, beeswax and pure essential oils. When lit, it will emit a soft illuminating glow with a soothing aroma. 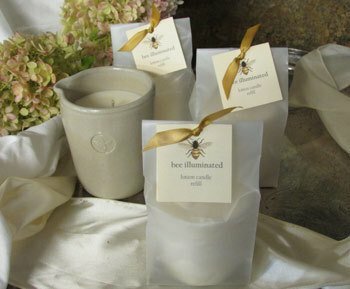 Our lotion candle refills are made with soy wax, shea butter, sweet almond oil, beeswax and pure essential oils. When lit, it will emit a soft illuminating glow with a soothing aroma. When you have finished using up the lotion in your decanter, simple clean out the decanter (it is dishwasher safe! 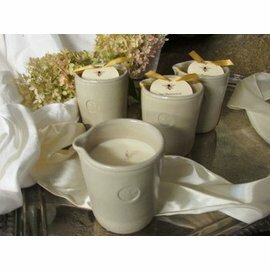 ), remove the refill candle from the wrapper and place in the stoneware decanter. And enjoy the luxurious lotion again! Soy candles are non-toxic and non-carcinogenic. Soy candles burn cooler and cleaner (producing 95% less soot) than petroleum or gel candles. The wick is 100% cotton. Free from preservatives, formaldehyde products, dyes and fillers. "As a small, privately owned company, we are conscientious about preserving our earth and its bounty. All of our body care products are made using only the highest quality natural ingredients. 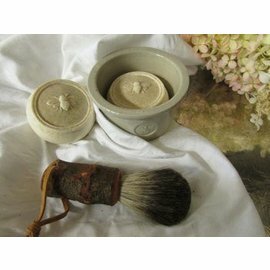 They are free from genetically-modified ingredients, parabens, petro-chemicals, synthetic fragrances and synthetic dyes. They are also packaged in eco-friendly containers. We adhere to cruelty-free research and are a member of the NH Bee Keepers Association. 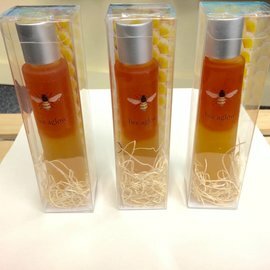 A portion of the profits from our beeline collection is donated to the Honey Bee Research Fund."